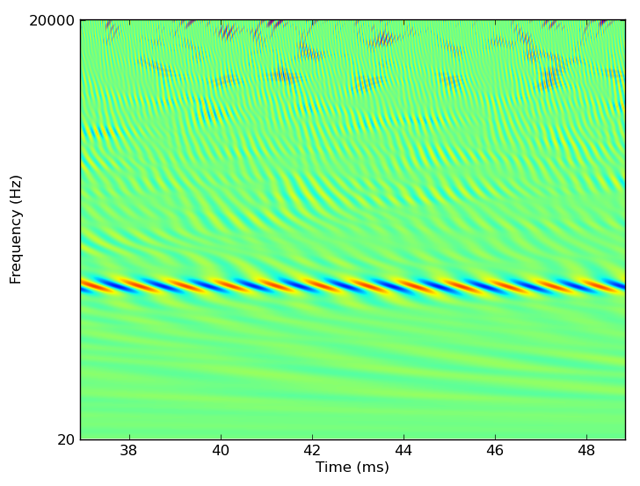 Brian hears is an auditory modelling library for Python. It is part of the neural network simulator package Brian, but can also be used on its own. To download Brian hears, simply download Brian: Brian hears is included as part of the package. The human cochlea applies the equivalent of 3000 auditory filters, which causes a technical problem for modellers which this package is designed to address. At a typical sample rate, the output of 3000 filters would saturate the computer’s RAM in a few seconds. To deal with this, we use online computation, that is we only ever keep in memory the output of the filters for a relatively short duration (say, the most recent 20ms), do our modelling with these values, and then discard them. Although this requires that some models be rewritten for online rather than offline computation, it allows us to easily handle models with very large numbers of channels. 3000 or 6000 for human monaural or binaural processing is straightforward, and even much larger banks of filters can be used (for example, around 30,000 in Goodman DFM, Brette R (2010). 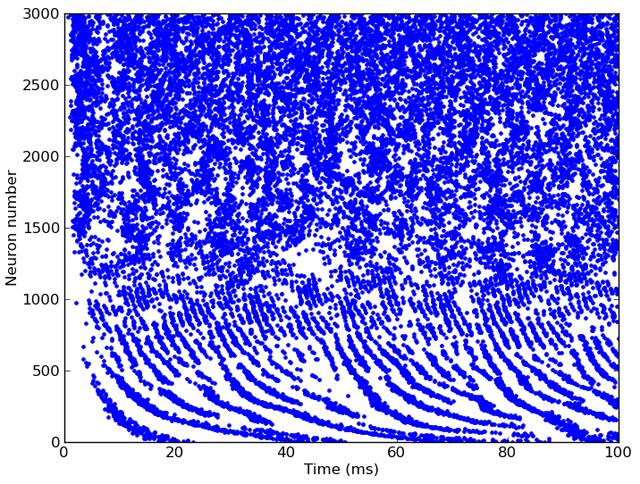 Spike-timing-based computation in sound localization. PLoS Comput. Biol. 6(11): e1000993. doi:10.1371/journal.pcbi.1000993). Techniques for online computation are discussed below in the section Online computation. Brian hears consists of classes and functions for defining sounds, filter chains, cochlear models, neuron models and head-related transfer functions. These classes are designed to be modular and easily extendable. Typically, a model will consist of a chain starting with a sound which is plugged into a chain of filter banks, which are then plugged into a neuron model. The two main classes in Brian hears are Sound and Filterbank, which function very similarly. Each consists of multiple channels (typically just 1 or 2 in the case of sounds, and many in the case of filterbanks, but in principle any number of channels is possible for either). The difference is that a filterbank has an input source, which can be either a sound or another filterbank. To download Brian hears, simply download Brian: Brian hears is included as part of the package. Reference documentation for Brian hears, which covers everything in this overview in detail, and more. List of examples of using Brian hears. For more details on combining and operating on sounds, including shifting them in time, repeating them, resampling them, ramping them, finding and setting intensities, plotting spectrograms, etc., see Sound. The erbspace() function constructs an array of centre frequencies on the ERB scale. The GammatoneFilterbank(source, cf) class creates a bank of gammatone filters with inputs coming from source and the centre frequencies in the array cf. The FunctionFilterbank(source, func) creates a bank of filters that applies the given function func to the inputs in source. For a more general (but more complicated) approach, see RestructureFilterbank. Two of the most important generic filterbanks (upon which many of the others are based) are LinearFilterbank and FIRFilterbank. The former is a generic digital filter for FIR and IIR filters. The latter is specifically for FIR filters. These can be implemented with the former, but the implementation is optimised using FFTs with the latter (which can often be hundreds of times faster, particularly for long impulse responses). IIR filter banks can be designed using IIRFilterbank which is based on the syntax of the iirdesign scipy function. Note that the new source should have the same number of channels. To do the same thing with online computation, we simply store a vector of the running sum of squares, and update it for each buffered segment as it is computed. At the end of the processing, we divide the sum of squares by the number of samples and take the square root. If the computation you wish to perform is more complicated than can be achieved with the process() method, you can derive a class from Filterbank (see that class’ reference documentation for more details on this). The Sound, OnlineSound and Filterbank classes (and all classes derived from them) all implement the same buffering mechanism. The purpose of this is to allow for efficient processing of multiple channels in buffers. Rather than precomputing the application of filters to all channels (which for large numbers of channels or long sounds would not fit in memory), we process small chunks at a time. The entire design of these classes is based on the idea of buffering, as defined by the base class Bufferable (see section Options). Each class has two methods, buffer_init() to initialise the buffer, and buffer_fetch(start, end) to fetch the portion of the buffer from samples with indices from start to end (not including end as standard for Python). The buffer_fetch(start, end) method should return a 2D array of shape (end-start, nchannels) with the buffered values. From the user point of view, all you need to do, having set up a chain of Sound and Filterbank objects, is to call buffer_fetch(start, end) repeatedly. If the output of a Filterbank is being plugged into a FilterbankGroup object, everything is handled automatically. For cases where the number of channels is small or the length of the input source is short, you can use the Filterbank.fetch(duration)() method to automatically handle the initialisation and repeated application of buffer_fetch. To extend Filterbank, it is often sufficient just to implement the buffer_apply(input) method. See the documentation for Filterbank for more details. Brian hears comes with a package of predefined filter classes to be used as basic blocks by the user. All of them are implemented as filterbanks. Finally, Brian hears comes with a series of complex nonlinear cochlear models developed to model nonlinear effects such as filter bandwith level dependency, two-tones suppression, peak position level dependency, etc. You can work with head-related transfer functions (HRTFs) using the three classes HRTF (a single pair of left/right ear HRTFs), HRTFSet (a set of HRTFs, typically for a single individual), and HRTFDatabase (for working with databases of individuals). At the moment, we have included only one HRTF database, the IRCAM_LISTEN public HRTF database. However, we will add support for the CIPIC and MIT-KEMAR databases in a subsequent release. There is also one artificial HRTF database, HeadlessDatabase used for generating HRTFs of artifically introduced ITDs. For more details, see the reference documentation for HRTF, HRTFSet, HRTFDatabase, IRCAM_LISTEN and HeadlessDatabase. © Copyright 2008, Romain Brette, Dan Goodman. Revision 31c72e96.